At Challa Eye Hospital we do Pterygium Surgery with latest technique of Conjunctival Autografts & Amniotic Membrane transplants. A pterygium is a triangular shaped lump of tissue, which grows from the conjunctiva (the thin membrane that covers the white of the eye) onto the cornea (clear central part of the eye). A pterygium can occur in both eyes, usually on the nasal side of the eye. The exact cause of a pterygium is unknown, but they are strongly associated with exposure to ultraviolet radiation,hot and dry environments. Pterygiums are more common in India especially among people such as farmers who spend a lot of time outdoors, but anyone can develop a pterygium. At Challa Eye Care Center we use the best treatment modalities to prevent recurrence of the pterygium, though the risk of this happening in each particular case is not predictable. 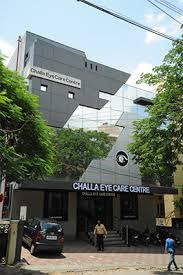 Challa Eye Care Centre is one of the Best Eye Hospital in Hyderabad offering comprehensive and contemporary treatment for Pterygium. We are known as Best Eye Care Centre in Hyderabad for conjunctival autografts & amniotic membrane transplants to prevent recurrent pterygia.